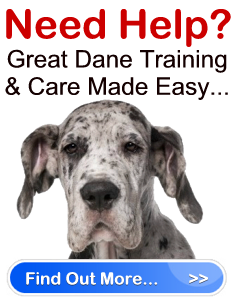 More Great Dane Training Tips " "
Great Dane training is something you need to start in the early stages of your dog’s life. When he is a puppy, your Great Dane requires proper obedience training so you will have the right control over him when he is fully grown. Furthermore, a well trained Great Dane is a happy dog, as this breed loves to work, and is eager to follow the commands of his master. Great Dane training begins and ends with you. Therefore, what you teach your Great Dane and when you teach it, has an influence on the dog he will grow up to be. You should take the time to enroll your Dane into an obedience school as soon as he’s of an acceptable age. However, until then, there are a few basic Great Dane training techniques you can teach your dog yourself, such as how to walk nicely. 1. Put your Great Dane on a 4-foot leash and take him out for a walk. However, unlike previous walking experiences, this time your goal is to no longer tolerate your dog pulling on the leash. Therefore, every time your Dane pulls the leash, immediately stop walking by planting your feet firmly on the ground. Do not move. As long as your dog continues to pull remain still. As soon as your Dane stops tugging on the leash, immediately praise him and continue to walk again. 2. Each time your dog pulls on the walk, put your “walking nicely” Great Dane training rules into effect and stop. Once he stops tugging, be sure to praise him right away, and give him the occasional treat to reinforce the fact that you are pleased with his behavior. 3. Should your Great Dane prove resistant to your training methods, instead of stopping each time he pulls, quickly turn and begin walking in the opposite direction. This sudden change in direction will startle your dog. Continue to change directions until his pulling becomes less severe. Then resort back to the stopping method. 4. Finally, if you really find teaching your Great Dane to walk nicely is proving to be more difficult than you thought, you can also consider using a head halter. A head halter is not a muzzle, it is more like a bridle a horse wears. Essentially, the head halter forces a dog’s body to follow the head. It is not possible for a dog to pull while wearing one. With consistency, encouragement, and plenty of praise for a job well done, you’ll discover that Great Dane training isn’t impossible, whether you are teaching him to walk nicely, sit or fetch.